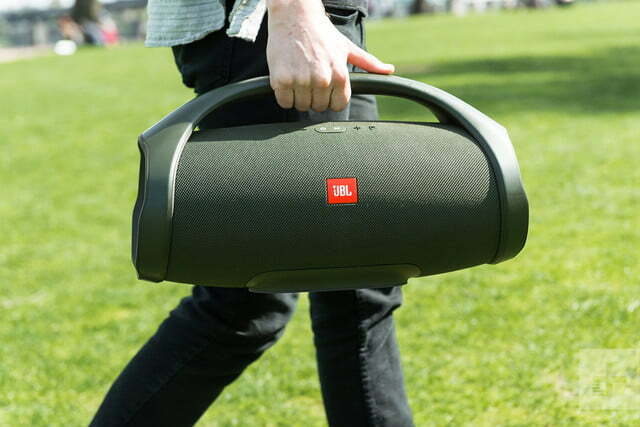 JBL’s Boombox can fuel a party for days on end. If you’ve ever seen Say Anything, the classic 1989 Cameron Crowe-John Cusack romance flick, you may have had fantasies about taking a boombox and serenading your crush in the wee hours of the morning, possibly to Peter Gabriel’s In Your Eyes. 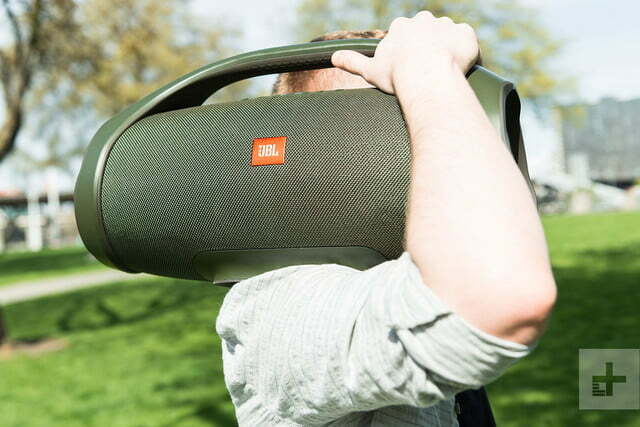 JBL’s new Boombox speaker can make that fantasy a reality — though it is a little hefty to hold above your head for hours on end. 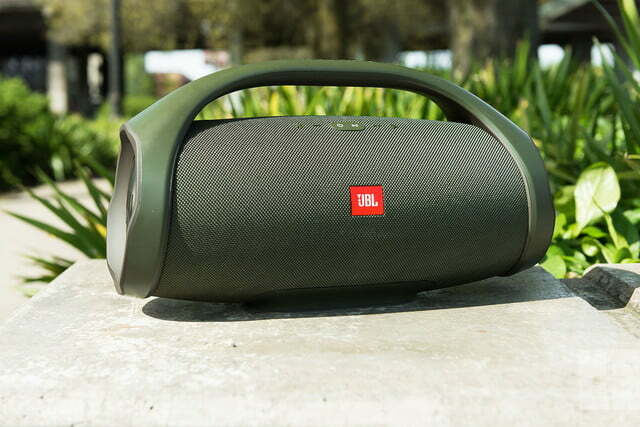 Not only is JBL’s Boombox massively powerful, it’s fully waterproof and capable of charging your phone. 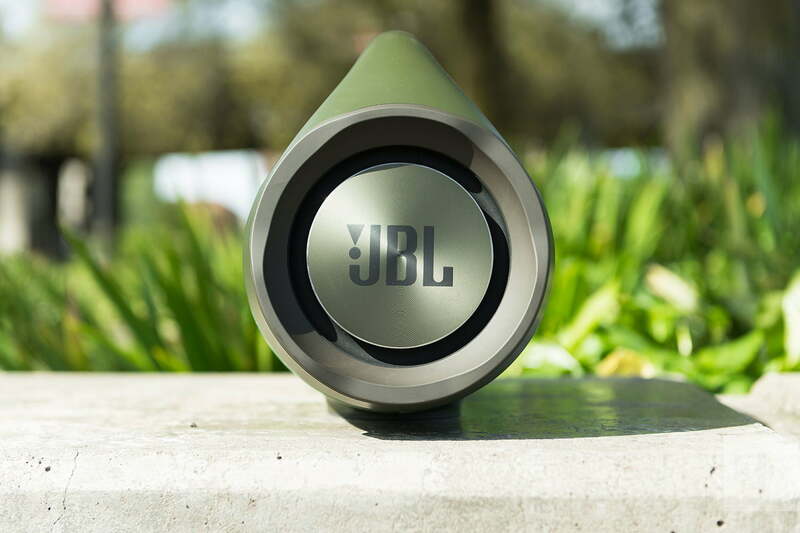 We put it through the wringer, and, for the most part, this stylish tube of sound proved itself worthy as a great outdoor option – if you’ve got the cash. 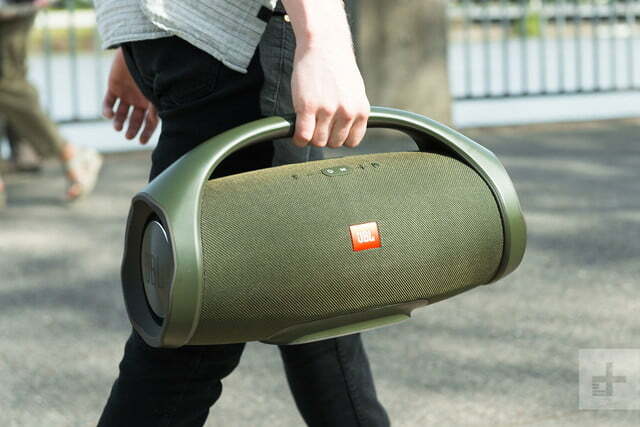 Like most JBL products, the Boombox arrives encased in an orange-and-white cardboard box with lots of branding. It’s got more of a “fun” feel than a premium feel, but it’s a boombox, so that’s appropriate. Included with the speaker: Product literature (quick-start guide, warranty info, troubleshooting) and a two-piece, brick style power adapter. Presumably, such power is required to charge the speaker’s mammoth 20,000mAh battery. As an aside, it’s always nice to have setup instructions with words instead of JBL’s included Lego-style pictures. We understand the aim of making speakers ready for global distribution, but we wish there was at least a URL available leading to instructions in place of dozens of pages of paper warranty info and fine print. That said, getting started is pretty simple, as the Boombox automatically enters pairing mode when first powered on. While the Boombox undoubtedly takes inspiration from the battery-powered, cassette-loaded relics of yore (Say Anything turns 30 next April! ), technologically speaking, it’s in another stratosphere entirely. 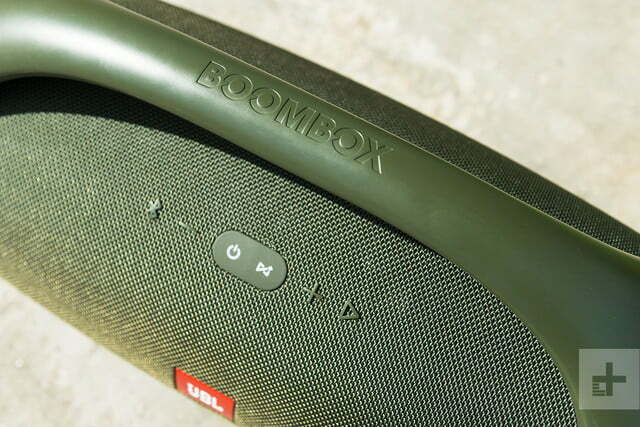 The Boombox takes inspiration from cassette-loaded relics, but it’s packed with modern tech. As with JLab’s recent nostalgia play, the Walkman-inspired Rewind Wireless Retro earphones, JBL is clearly hoping to mine some vintage vibes with the Boombox. 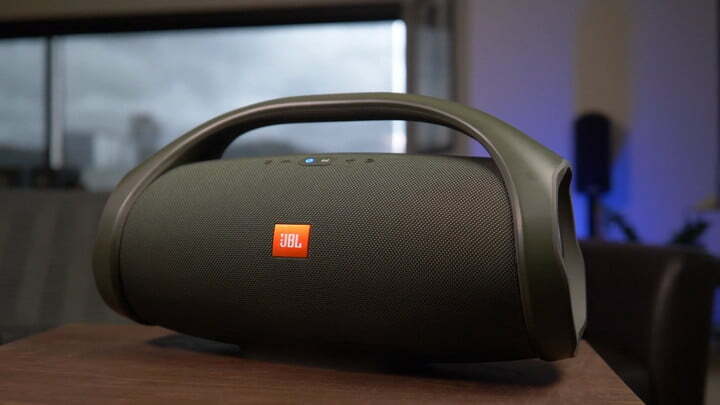 Unlike the Retro, though, JBL’s $450 Boombox eschews gaudy throwback aesthetics altogether, opting instead for a slick, modernized look which fits seamlessly with portable JBL mainstays like the Flip 4 and Charge 3. In fact, the Boombox looks almost like an oversized Charge 3, but with a sturdy plastic handle connecting the end caps. It’s measures approximately 2 x 1 x 1 (feet), and weighs about 11.5 pounds. To test the waterproofing, we ran water all over the Boombox, which had no discernible effect. We didn’t submerge it entirely, but the speaker’s IPX7 rating means it can easily withstand a full dunk in shallow water. 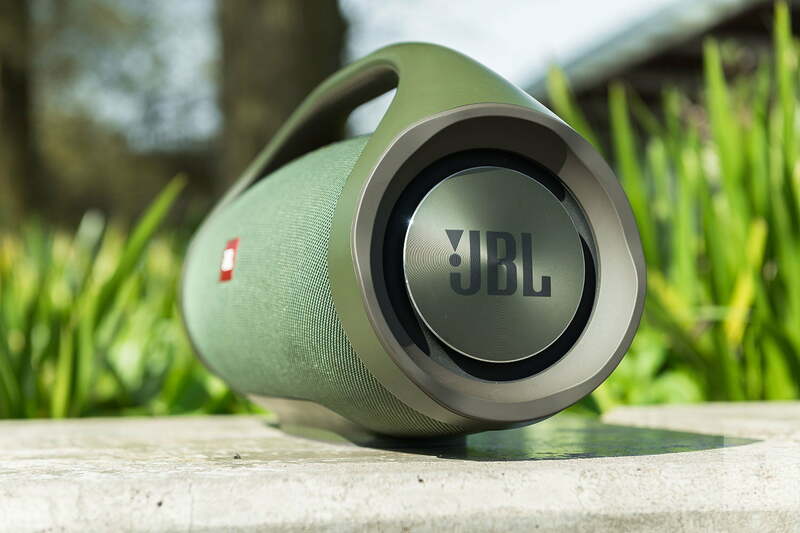 Our review model came in forest green, though the Boombox is also available in black (which we would’ve preferred, but … c’est la vie). 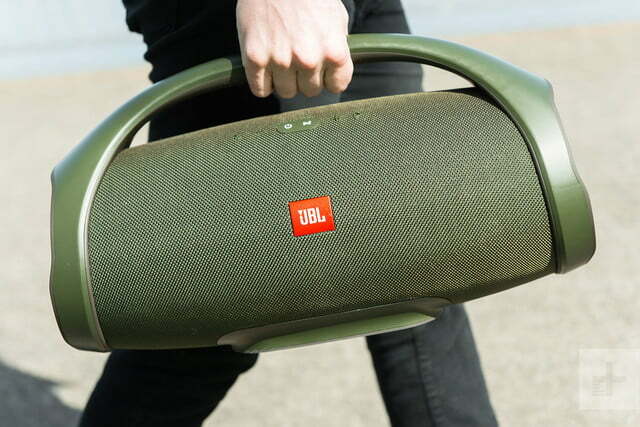 Below the handle – which, for the record, is not removable – rest six buttons which control Bluetooth pairing, volume, power, play/pause, and JBL Connect+, the company’s proprietary way to link multiple speakers. You can connect three devices to the Boombox simultaneously via Bluetooth. You can also sync it up with any newer JBL speaker with Connect+ via the JBL Connect app (this is currently limited to the newer Flip 4 and Pulse 3 speakers, though). 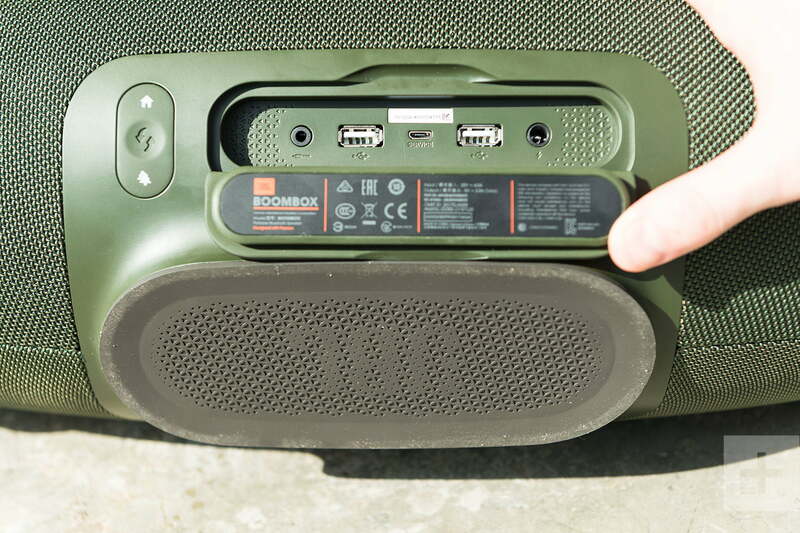 The Boombox’s big battery can charge two devices at once, which one-ups pretty much every other speaker. JBL’s logo is visible on the Boombox’s two end caps, as well as on the speaker’s front side, below the control panel. Down below the red logo, near the bottom are five little LEDs which indicate battery level. 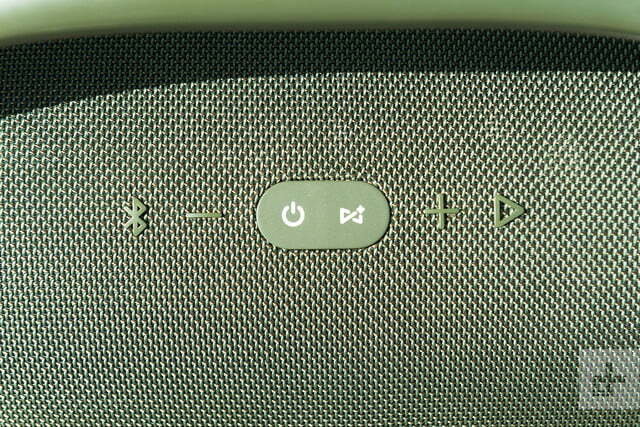 The power button also lights up to indicate power and Bluetooth status. 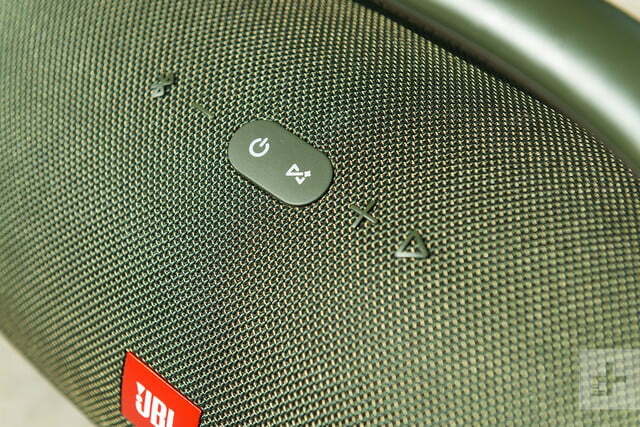 At the speaker’s rear is a large rubber flap which can be pried back to reveal five ports: Two USB-out ports for charging devices, a 3.5mm auxiliary input, Micro USB input (for service only), and the power input (JBL hid all the small print and electrical info cleverly on the flap’s interior). Next to the flap is a button to swap between indoor and outdoor EQ modes (more on that below). The Boombox’s beefy battery can charge two devices at once while playing music – an awesome feature which one-ups the vast majority of speakers we encounter in terms of utility. It doesn’t charge those devices particularly fast (and the Boombox itself requires about five hours to charge fully), but you know the drill about beggars and choosers. Most impressive is the speaker’s 24-hour battery runtime. In our testing, the Boombox blew most other speakers out of the proverbial water when it comes to pure power. Other than the ridiculous Soundboks 2 (which costs twice as much as the Boombox at $900), it grades out as the best outdoor speaker we’ve tested yet, thanks in no small part to dual 4-inch woofers. Hip-hop tracks pump out with authority, and anything bass-driven – we particularly enjoyed jamming to some dancehall tracks — sounds good blasting through the grille. 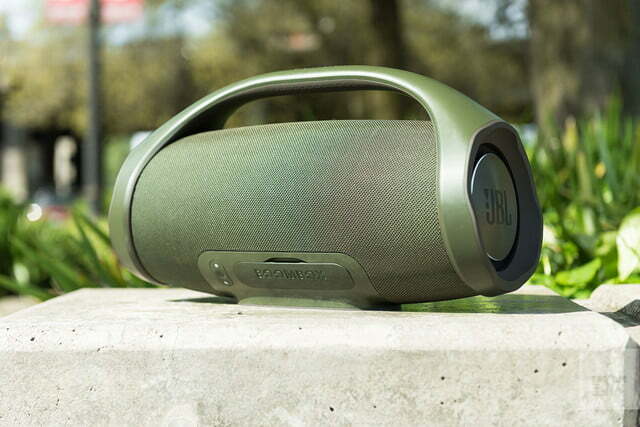 Listening outdoors, the Boombox cuts through ambient noise and wind with ease, projecting relatively clear audio for 40 or 50 feet easily. The sound signature is a little too bass-heavy for our taste. 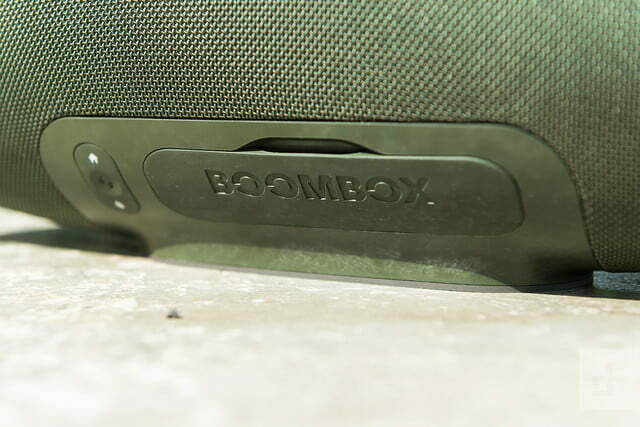 We appreciate the inclusion of indoor/outdoor mode selection (something the Soundboks also has), but the Boombox’s sound signature was a little too warm for our taste, even in indoor mode. Other than the two modes, there’s no way to customize the speaker’s EQ – not even via app — which is disappointing. Upper register response tends to get drowned out by the bass and midrange frequencies, and the speaker sacrifices clarity and detail up top in favor of a more rounded, bass-heavy sound. Songs with lots of acoustic instrumentation can get muddy as drum beats tend to push lower guitar back in the mix while vocals can occasionally come through with too much echo. 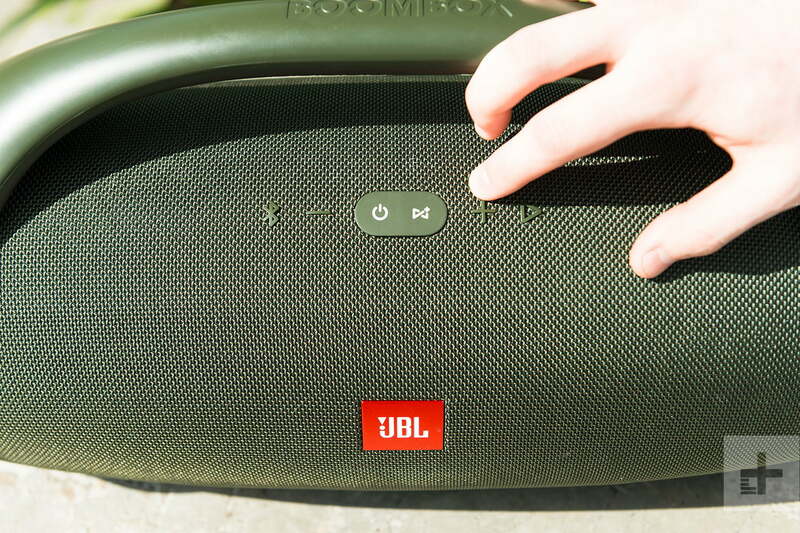 That said, the Boombox does get damn loud – even at 70 percent volume, it was too much for this reviewer’s spacious kitchen/dining room area – and you really can’t hope to hear detailed treble in an outdoor environment anyway, regardless of your gear. For its intended purpose, the Boombox performs admirably (if not exceptionally). 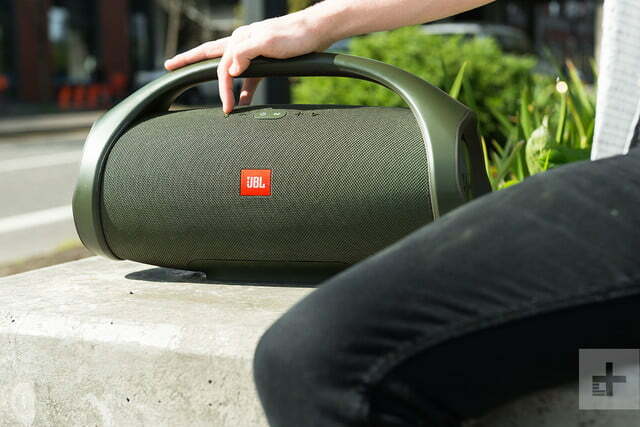 As with most JBL products, the Boombox is under warranty for one year, covering defects in manufacturing, materials, and workmanship. 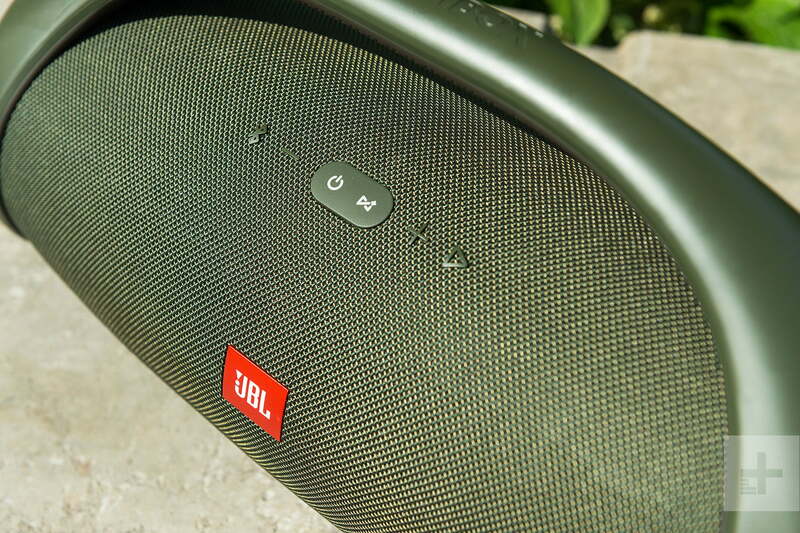 The Boombox didn’t blow us away with crisp clarity, but it doesn’t really need to. It’s sturdy, stylish, big enough to power a party for hours, and it can charge two phones at once. If you’re in search of some jams for your picnic, camping trip, beach outing, or something similar, this should be on your short list. $450 is a lot for a portable speaker. For a cheaper alternative, consider the $300 Braven Ready Elite. If price is no object, the $900 Soundboks 2 is basically a super-powered version of the Boombox, minus the charge-out ports. That said, the Soundboks 2 is more like luggage than a boombox, and simply can’t travel as easily. The Boombox’s construction feels exceptionally sturdy, and considering its waterproof nature, it should hold up for a long time. The plastic parts are definitely not scratchproof, but most damage should be cosmetic (so long as no liquid gets in under the back flap). 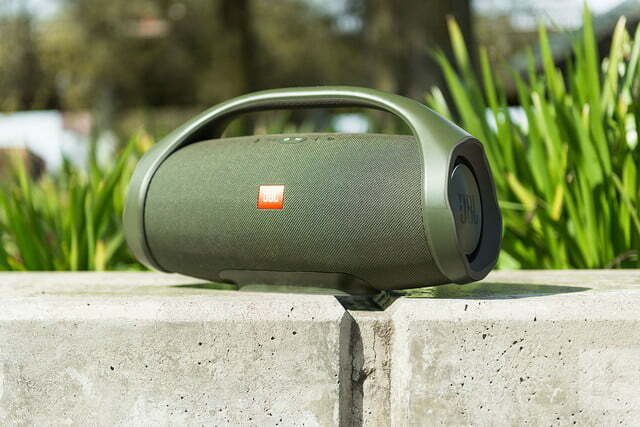 If you’re willing to shell out nearly $450, the Boombox offers impressive outdoor audio performance and dual charging ports, something few competitors can claim. If you’re pinching pennies, though, there are plenty of cheaper ways to get your outdoor soundtrack.